Source: La Via Campesina. 9 September 2009 Today we celebrate September 10, International Day of peasant struggles against the WTO. Every year when this day comes, we remember September 10, 2003, and our mobilization against the WTO in Cancun. For farmers and peasants around the world the fight against the WTO is a struggle for life. Trade liberalization is like a steamroller. Each time it moves forward, more farmers disappear. In 2003, Korean farmers were among those who neoliberal policies struck hardest. Due to strong competition from cheap imports, many producers could no longer sell their own harvests. Mr Lee Kyung Hae was one of those farmers whose right to live in dignity from farming was denied by international trade. 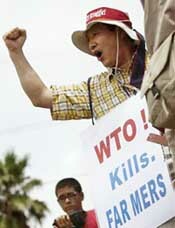 In Cancun, he climbed the fence of the WTO ministerial meeting, with a sign over his body saying: WTO Kills Farmers! Then, a few moments later, blood poured from his chest. He had sacrificed himself to remind the key decision makers of their responsibility for the disappearance of peasant economies around the world. 6 years later, despite his death, little has changed. In 2009 Korean farmers live in fear of the scheduled opening of the rice market and the collapse of rice prices. This year on September 10, in memory of Lee, they will mobilize massively behind the slogan "No to the WTO, preserve the rice price!". Safeguarding a remunerative price has become more and more difficult as transnational companies (TNC) control the entire food chain from production to marketing. They hold big stocks and speculate on the prices of agricultural commodities. When prices increase bringing greater profits for some, this brings the greatest misfortune to the poorest consumers, new victims of WTO neoliberal policies. Farmers commit suicide, people are starving because they cannot buy food. We can't put up with such consequences of free trade advocated by the WTO, Free Trade Agreements (FTAs) and the TNCs! In addition to these are the ecological impacts of liberalization. The more that goods, including food, are commodified, liberalized and traded around the world, the more greenhouse gases are emitted into the sky. The WTO and bilateral FTAs are concrete dangers for humanity and the planet. This year La Via Campesina started to commemorate Lee's death on September 3rd when, at the initiative of the Indian Government, a small WTO meeting was organized in India to relaunch the Doha Round. More than 50,000 protesters gathered in the streets of New Delhi and the spirit of Lee made them strong. Inspired from this rally, we want to vividly maintain this spirit of struggle of Lee for the coming month. We urge all our supporters to join us and to organize actions to denounce the brutal control of our economy by the TNCs. Several opportunities will come to us in the coming months to demand from our leaders concrete commitments towards food sovereignty. On October 16th, Via Campesina will participate and organize actions against Monsanto, which continues to grab land and seeds, despite the fact that these represent the heritage of humanity (for more info visit: http://www. Combat-monsanto.co.uk /). In Mexico, since March 2008 a new law allows the cultivation of transgenic corn. As Mexico is the birthplace of thousands of varieties of corn, such a law is a clear abuse not only for the Mexican people but for humankind in general. Therefore, many actions throughout the country and an international forum will be organized. Please let us know in advance at viacampesina [at] viacampesina.org all actions you will plan around the world so that we can promote them on our website. From November 30 to December 2 in Geneva the Seventh WTO Ministerial Conference will be held. La Via Campesina was strong and determined in Seattle, Cancun and Hong Kong. It will also be in Geneva. Certainly for the current weakness of the WTO, and renewal in many delegations, it is unlikely that the 7th conference will produces concrete steps. To date, this 7th Conference has been presented as a gathering to evaluate the overall state of the system of multilateral trade, and not as a negotiating session. However, at the same time the G20, India, and the WTO Director multiply initiatives of meetings to try to conclude the flawed Doha Round by 2010. Therefore, in the coming months and until the end of November, peasant organizations of Via Campesina will keep the pressure on their government. In India, for example, after the meeting in New Delhi and the statements of Indian trade Minister, they plan to have a chain of mobilizations right up to the village level all across India leading to the WTO Geneva meeting at the end of November. In the U.S. too, Via Campesina North America, is preparing actions against the G20 meeting in Pittsburgh scheduled from September 23 to 25. Join the mobilization! Inform us of your actions, and don't hesitate to send photos and videos at viacampesina[at]viacampesina.org! Let's together, globalize struggle, and globalize hope!